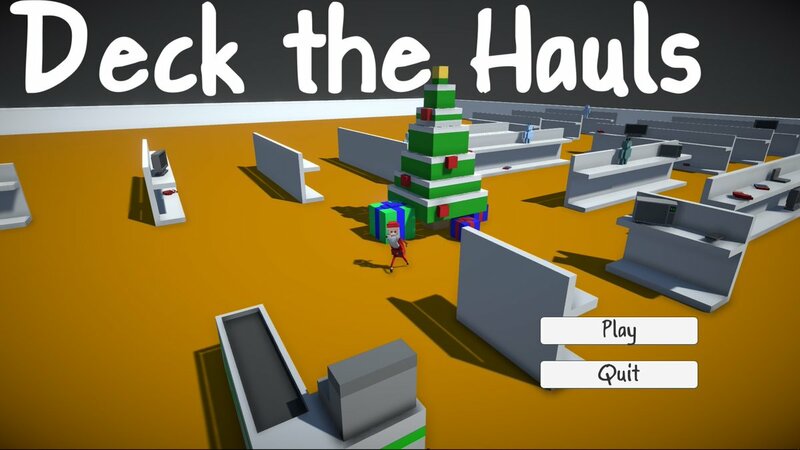 Ludum Dare 40 – Deck the Hauls! Over the weekend, me and a friend from Uni, Andrew (@NattressGFX), decided to take part in our first Ludum Dare jam. We decided to do the jam, rather than the compo, as this was only his first jam, and my second. The theme for the jam was, ‘The more you have, the worse it is.’ This theme was initially horrible for us, as we both had no ideas for it. 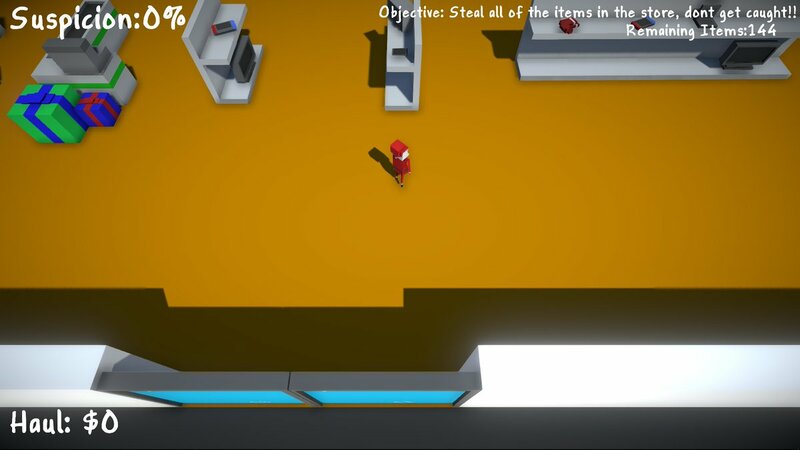 After a short brain storm we decided to make a shoplifting game, in which the more items you steal, the more likely you are to be caught by the security guards. After coming up with our initial idea, we quickly got to work. It started out pretty basic, with a green cube walking around on another white cube. Pretty standard, but it was a good start. Then we began work on adding very basic security guards that could walk between multiple waypoints and chase the player if they did anything too suspicious. Next we began too add some basic assets into the game and added the base stealing mechanic. This was complemented nicely with our hovering Santa, which was a result of an animation bug! But now we could steal and get chased, which was a nice start. After this point Andrew has to leave for work for a few hours, so I knuckled down and began developing solo for a bit. By the time Andrew rejoined me, the project was begging to look a little more like a game. Looking at the large empty level was very daunting however, as it just reminded me how many more assets had to be made so that the map wouldn’t feel so repetitive. This was eventually fixed, however I still would have liked to add a bit more variety to the level. One way we managed to improve the level was by adding roaming NPC’s. This had the effect of making the map look more populated, making the level feel more like an actual shop, especially around Christmas time. After this, we put a lot more time into expanding the map and adding more base functionality into the game. Then I added some of Unitys post-processing effects to slightly improve the visuals. By Monday, we had a finished product. Whilst there are many things in the development process that I would like to do differently in future, the weekend stood out as an excellent learning experience for me. I will definitely be participating in more game jams in the future!